Applicable to the diagnosis of heart, liver, gallbladder, kidney, spleen, stomach, pancreas, thyroid, breast, matrix, bladder, ovary, eyes, spermary and superficial skin. 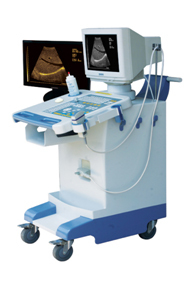 It is a linear or convex formation, multi-purpose ultrasonic diagnose instrument. Power supply has over voltage, over current and sudden power disconnection protection mechanism. One 2.5/3.5/4.0/5.0MHz, Multi-frequency, broad band, Convex Probe. Main unit, 14” high resolution black/white VGA Monitor, 2.5/3.5/4.0/5.0MHz Convex Probe. Cine loop, 64 frames, play, back-play, searching and freezing function available. optional 3 different functional probes. timely color display work station.